Many people spend a lot of time and money finding ways to save energy and reduce their household’s carbon footprint but forget all that they have learned about conservation the moment they hit the lake or river. Boating and living the green life don’t have to exist on conflicting terms. There are many ways you can conserve energy and be kind to the environment while still enjoying your time on the boat this summer. 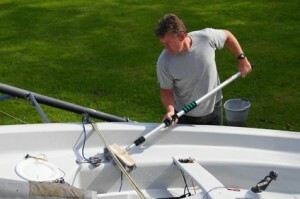 Minimizing the maintenance and cleaning of your boat while in the water is one of the best measures you can take to prevent toxins from entering the water, according to the California Department of Boating and Waterways. They advise completing as many maintenance projects as you can while the boat is in dry dock and using biodegradable, non-toxic cleaning agents when you scrub your boat both in and out of the water. Use auto-pilot – Most modern automatic steering programs use fuel more efficiently than human helmsmen. Don’t push water – Adjusting your trim tabs and hydrofoils enables you to cut through the water and use less fuel. Use the correct prop – Using the right prop—one that has a pitch that gives your boat the RPM level that the boat is designed for—will use less fuel. Reduce your idling time – Turn off your engine instead of idling whenever possible. Keep your engine well-tuned – A properly tuned engine uses less fuel. Throwing your trash overboard makes rivers and lakes messy and unsafe for all boaters and wildlife. In fact, learning how to manage your trash and waste is just as important as taking your boater exam to get your boating license before taking to the water. Make sure to corral your trash and dispose of it properly when you return to shore. Even cigarette butts can be hazardous to marine life. If your boat has a lavatory, make sure that you dispose of your waste in a designated disposal area. Knowing where you’re headed before you start the boat engine can help you from wasting fuel by wandering around deciding on a destination. Judicious mariners will plot their course before departure to avoid delicate shallow sea floors that can be damaged by the boat’s propellers. Enrolling in a navigation course in addition to taking your boater exam will prove invaluable when steering through the waters. Oil and water don’t mix. To avoid your boat’s oil and gas from leaking into the water, use oil-absorbent rags when refueling and make sure to use a bilge filter so that the oil in your engine doesn’t back up into the lake or other waterway. Enjoying your boat this summer season doesn’t have to mean ignoring your green initiative. You just need to pay attention to your fuel, your trash and your cleaning agents to minimize your boat’s impact on the environment. Happy boating!